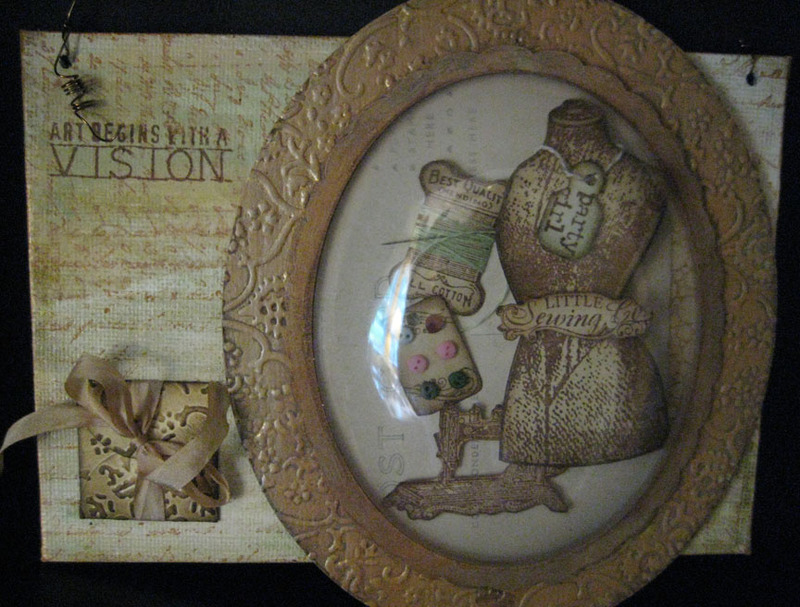 Supplies: Globecraft Memories globeframe, Ranger Paint Dabbers in Aqua, Butterscotch, Espresso, Willow and Gold; Claudine Hellmuth Studio Gesso, Inkessentials Glue N’ Seal (matte finish), 5X7-inch canvas panel, Studio 490 stamp (LCS048) A Form of Art, Crafty Secrets stamp (SS15) Material Girl, Ranger Archival Inks in Coffee and Sepia, Ranger Distress Inks in Antique Linen and Walnut Stain, Designer Dries Clear (Art Institute Glitter), embossing folder, envelope punch, wire, dimensional foam dots, needle and six mini buttons. 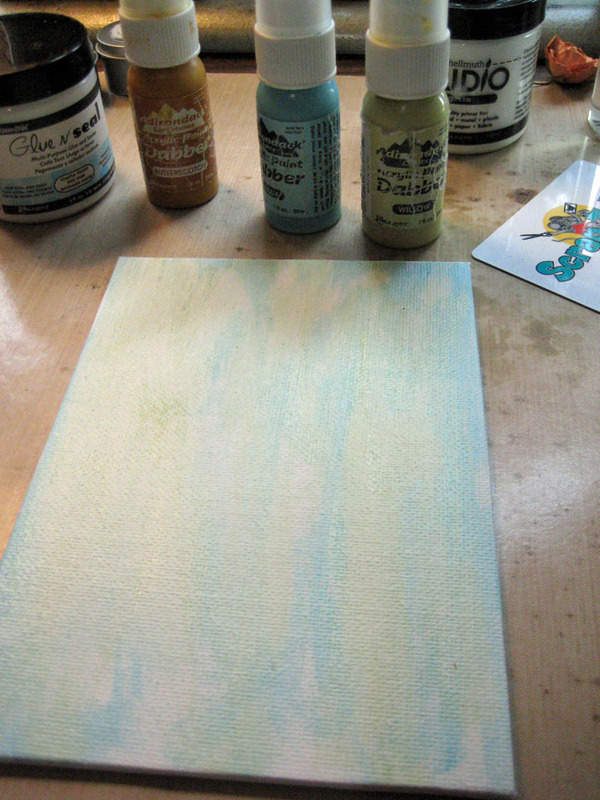 Prepare the background canvas by painting with Aqua, Butterscotch and Willow paints; spritz with water and blot randomly with paper towel; let dry or heat set. Brush the painted piece randomly with Gesso, ink script stamp with Sepia Archival Ink and stamp into wet Gesso. 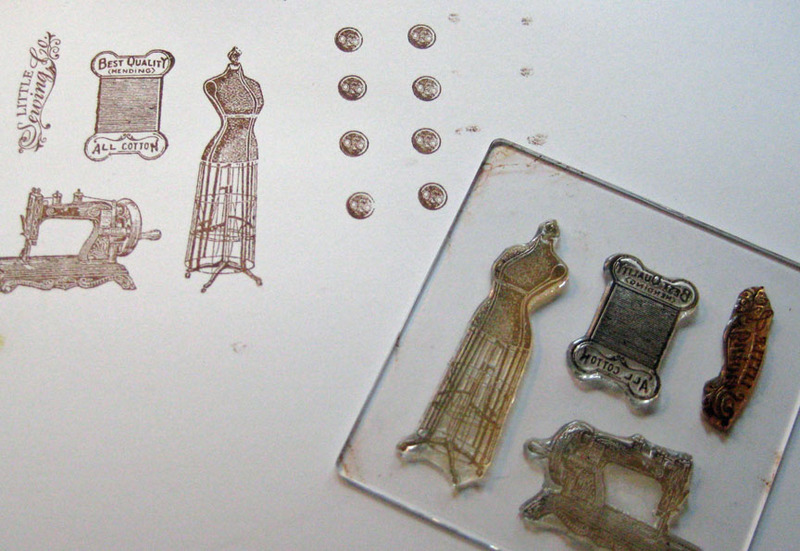 Be sure to immediately wash your stamp before Gesso dries. Emboss Globecraft Memories outer frame with embossing folder. 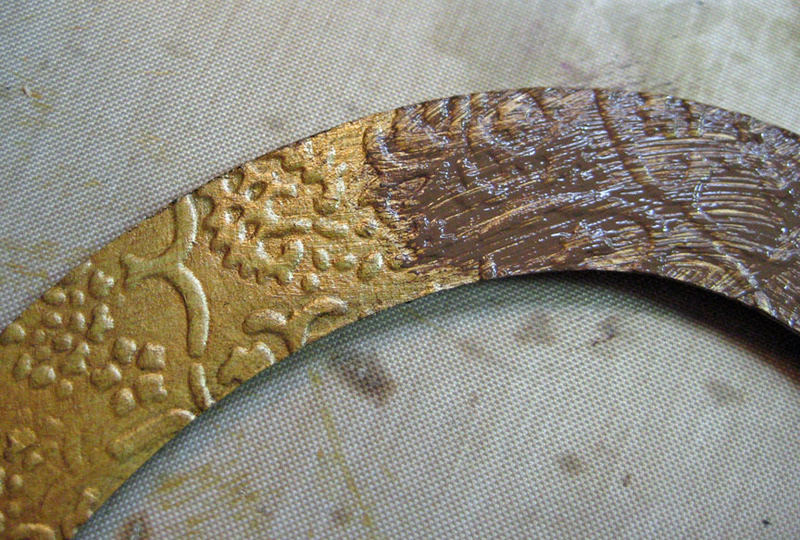 Paint with Willow, randomly brush on gold paint and let dry briefly. Go over with Espresso paint and rub into design; wipe off with damp paper towel then rub with gold paint and wipe away gently. Paint smaller decorative frame with same paints and techniques; Set aside to dry. Stamp images on white cardstock with Coffee Archival Ink; heat set. Cut all images out using detail scissors. 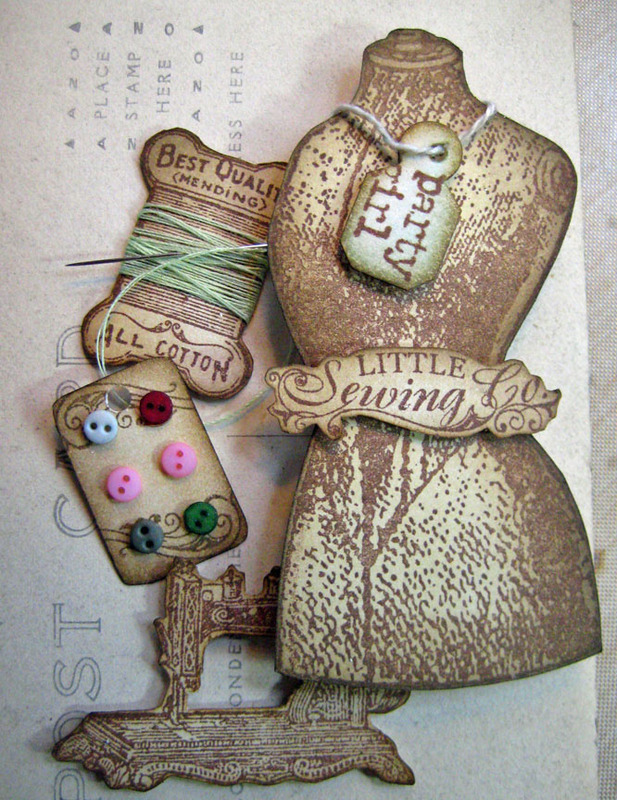 Hand write or stamp jewelry tag with phrase. 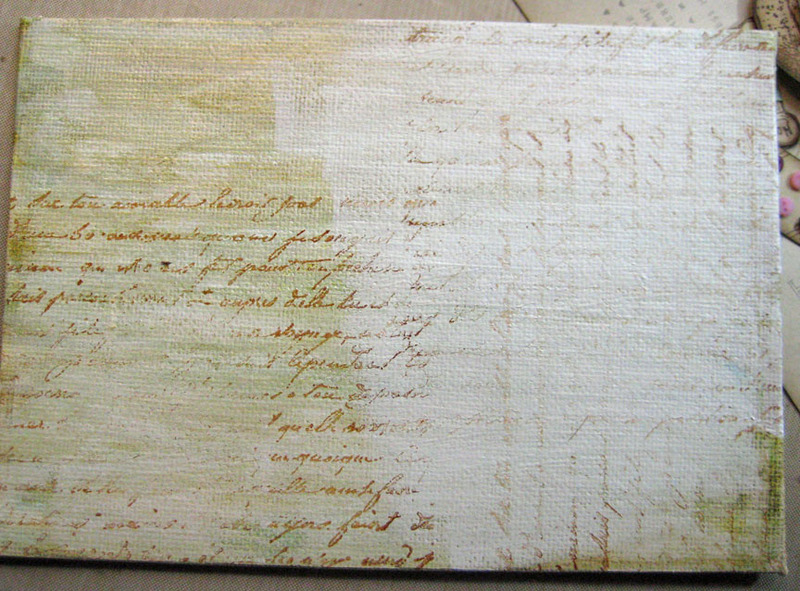 Using ink applicator, ink all pieces with Antique Linen Distress Ink and edge with Walnut Stain Distress Ink. Emboss punched envelope with embossing folder and ink with Antique Linen Distress Ink then edge with Walnut Stain Distress Ink; fold and wrap with ribbon. Wrap stamped thread spool with thread and weave a needle through. Adhere six mini buttons onto stamped and inked rectangle. Lay out finished images onto background (I used a vintage postcard) until you’re happy with the arrangement. Attach dimensional foam pop dots to back of some of the images to layer and stack. Fit into Globecraft Memories bubble and frame, glue frame pieces to bubble and bubble to background with Designer Dries Clear and use binder clips or clothespins to secure till glue sets. I stamped a quote with Coffee Archival Ink onto tissue paper, tore it out and adhered to the canvas with Ranger’s Glue N’ Seal. Punch two holes in top and add wire to hang. Tuck a little secret note into the envelope, edge the canvas lightly with gold paint and hang to enjoy! A sparkly state of mind … and then some! Beautiful wall hanging! 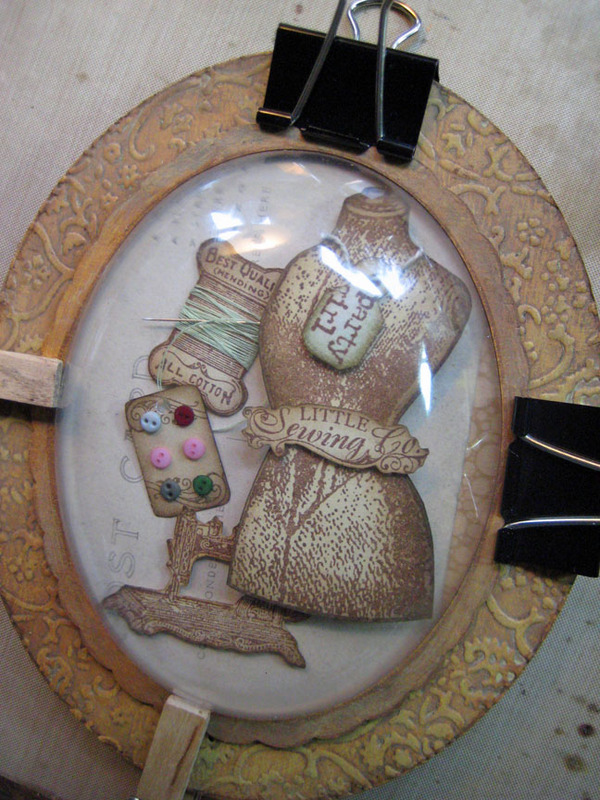 Love the embossed frame and the ‘necklace’ for your dress form. I love it. 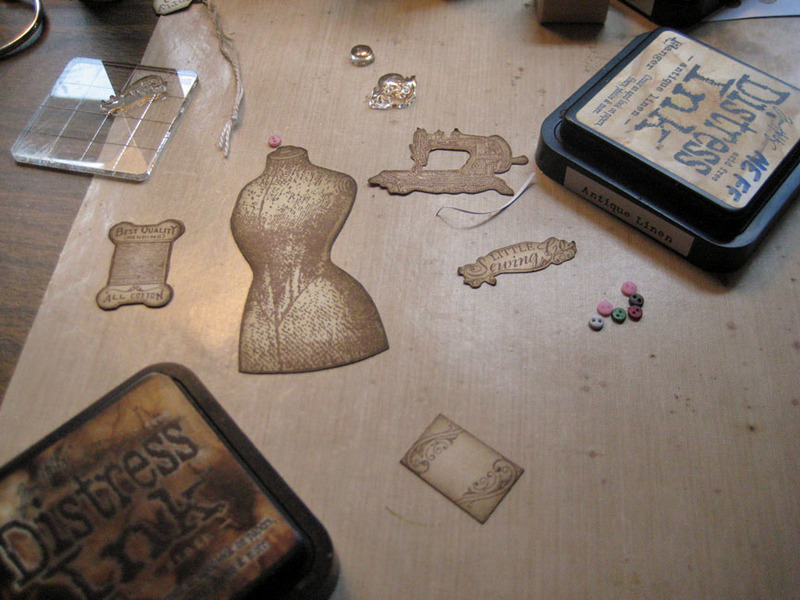 Great idea to emboss the chipboard! Thanks! The chipboard frames emboss so easily with the embossing folders and my Vagabond! This is awesome! I love your work.